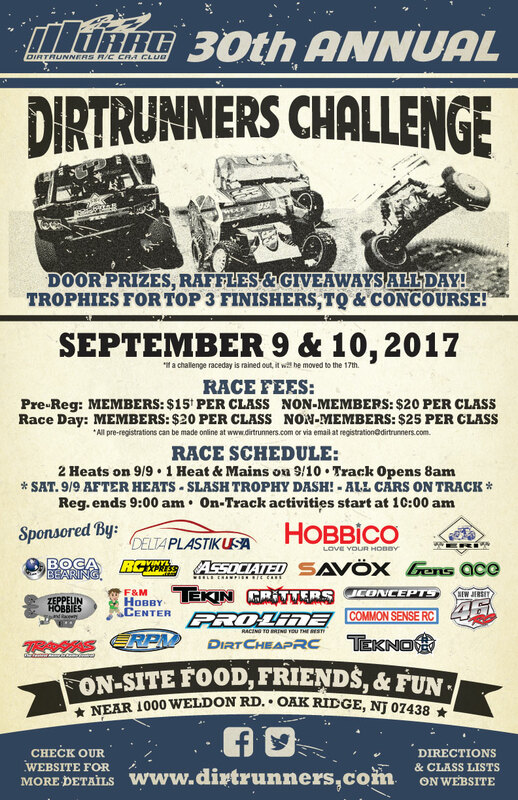 DirtRunner’s R/C Car Club proudly presents our 30th anniversary trophy race. 2 rounds of qualifying and The IRONMAN Invitational Slash Trophy Dash on Saturday 9/9, 1 round of qualifying and Mains on Sunday 9/10. Trophies awarded to the top 3 drivers in each class plus top TQ of each class. Concourse Sunday morning with trophies awarded to the top 3 painted bodies picked by a guest judge. Raffles, Door Prizes, 50/50, and much more Sunday. Full concession stand open both days featuring the BBQ expertise of Chef Sue.